This feature is pretty much self-describing. 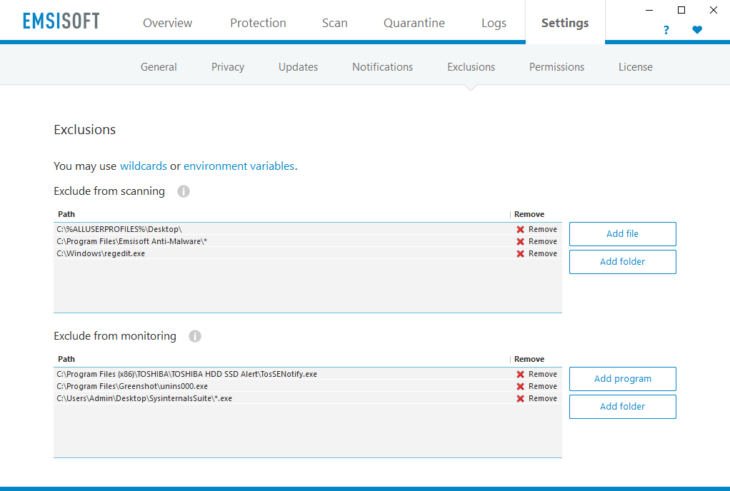 You select a specific file or a whole folder, and any malware detections during on-demand scans and File Guard scans will be skipped in those places. There are a few remote control tools available that can be legitimately used, but malware authors often bundle them too. If you still need to use these tools, you can exclude their file path from scanning with the Emsisoft scanner. Emsisoft’s detection signatures are rather on the more aggressive side when it comes to detection of potentially unwanted programs. At occasions, users may still want to use these programs, like browser toolbars. To avoid detection in future disk scans, simply add their installation folder to the list of exclusions. Instead of having control over which program files are excluded from scanning, here you can define that actions and behavior of specific programs shouldn’t be monitored. Each file reading or writing operation by a program potentially triggers a scan by the File Guard. But scanning a file is also a file operation that may trigger the same thing with a second antivirus program that may be installed. However, if that other antivirus opens a file for reading, it may again trigger another scan with Emsisoft, and so on. The result can be a system lockdown because all resources are used to scan a specific file again and again. To break that loop, you should always exclude any additional real-time protection programs in Emsisoft, and vice versa. In order to create world-class protection, Emsisoft’s real-time protection modules need to work closely with the core of the Windows operating system. That technology is called “hooks” and it basically means that our software sits between the operating system and the running programs, to intercept any security relevant operations if needed. Other software also uses hooks to create certain functionality and at times, this creates incompatibilities that lead to crashes or malfunction. If you experience problems like that, you can put the other program on the list of Monitoring Exclusions, to avoid that these programs are touched by Emsisoft’s code. The * sign replaces a random sequence of characters. While this is a very powerful feature that adds extra flexibility, it is also very dangerous when used wrong. If you accidentally create an exclusion for c:*, you would basically disable the entire protection functionality on your computer, as everything on drive C: would be excluded. Always make sure the wildcard symbol isn’t used at the end of the path sequence, but somewhere in the middle. Environment variables are a Windows standard feature that is mostly used by system administrators in command line scripts. They act as placeholders for common paths that may be different on individual installations of the system. Instead of manually looking up the actual path on each computer, you can let Windows do that for you. Note that environment variables are not just simple placeholders for a static path sequence. Since the protection modules work on System level, environment variables usually match one or many paths on a system. %USERPROFILE% excludes all user profile folders that typically reside at C:Users, not just the profile of the currently logged in user. 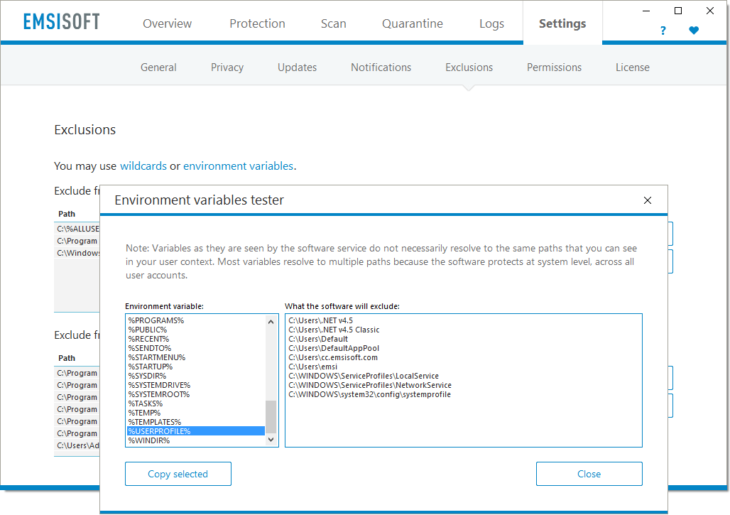 Click on the link “environment variables” in the upper area of the Exclusions dialog to see a tester for all available variables and how they are resolved on your specific system. While most home users will probably never have a need to create sophisticated exclusions, the newly added flexibility in the latest version comes very handy for system administrators who maintain larger numbers of computers. Emsisoft Enterprise Console fully supports all types of exclusions which allows expert users to define them centrally for the entire network at one single click.